The Pythagorean Theorem is much more than just a mathematical curiosity, it is a basic and useful mathematical property that shows up as the solution to many mathematical problems or in their proofs (the other two big ones are the right angle triangle and the trigonometric functions – but they are all related). There are over 300 different proofs for the Pythagorean Theorem, I like this one best. It is simple and only requires some basic knowledge about triangles and some elementary algebra. We could have called the third angle β (or some other symbol), but calling it 90 – α is a better choice (as we will see). 2) Rotate the triangle so the hypotenuse is horizontal (lying flat). This step isn’t necessary, but makes it easier to see what is happening. Rotating a triangle does not change its properties. 3a) Draw a perpendicular line from the hypotenuse through the corner opposite it. With the triangle rotated, it is simply a matter of dropping a vertical line from the peak to the hypotenuse. 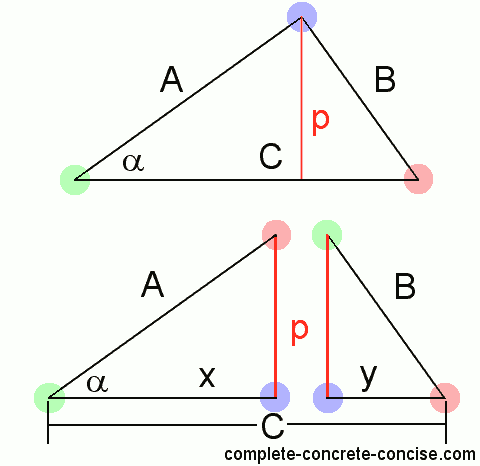 3b) This perpendicular line (which I call p) divides the original triangle into two smaller triangles. Side p becomes one of the sides of both smaller triangles. 3c) The whole of side A went to the triangle on the left hand side. 3d) The whole of side B went to the triangle on the right hand side. 4a) We know that one of the angles is 90 degrees. Because line p is perpendicular to the hypotenuse, the angle must be 90 degrees (coloured blue). 4b) When we divided the original triangle, the angle α remained in the LHS triangle, so we know this angle is α (coloured green). 4c) Since the angles in a triangle must add up to 180 degrees, we know that the remaining angle must be 90 – α degrees (coloured red). 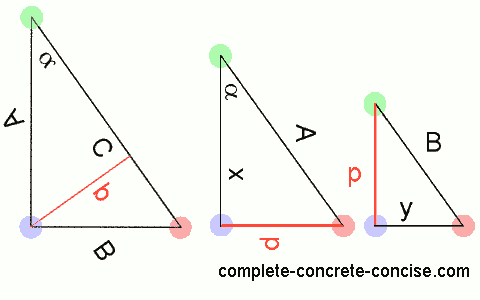 4d) Since both the original triangle and the LHS triangle have the same angles, both triangles are similar triangles. Similar triangles are triangles that have the same angles. The triangles may be different sizes, but the angles are the same. 4e) We know one of the angles is 90 degrees because line p is perpendicular to the hypotenuse (coloured blue). 4f) When we divided the triangle, the angle 90 – α remained in the RHS triangle, so we know this angle is 90 – α degrees (coloured red). 4g) Since the angles in a triangle must add up to 180 degrees, we know that the remaining angle must be α degrees (coloured green). 4h) Since both the original triangle and the RHS triangles have the same angles, they must be similar triangles. Rotating or flipping triangles does not change their properties. 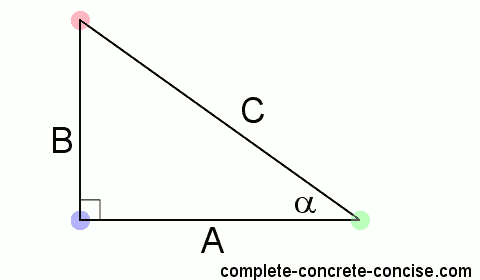 7) We know that the ratio A/C (of the original triangle) = x/A (of the LHS triangle): A/C = x/A. Fundamental to basic algebra is the ability to manipulate an equation any way we like – as long as we do the same thing on both sides. We can add 8 to both sides and the relationship remains the same: 4 + 8 = 4 + 8. What we want to do, is somehow bring B into the equation (we already have A and C). We can try A2 + B2 = Cx + B2, but that doesn’t help much (the B2 cancels out). We need to employ an algebraic trick – we don’t want to add the same thing to both sides of the equation, we want to add equivalent things. For example, consider 4 = 4. If we add 8 to both sides we would typically do it this way: 4 + 8 = 4 + 8. However, it is also perfectly valid to do: 4 + 8 = 4 + 1 + 2 + 5 (this is one of those non-intuitive mathematical tricks – but it is very useful). which is the Pythagorean Theorem.